← Keep on stretching …. Home » Uncategorized » Please don’t give me peas! Please don’t give me peas! Just back from a week walking along the coastal path of Cornwall based in the beautiful town of St Ives. We were lucky enough to have mostly good weather and were rewarded by stunning views at every twist and turn. Eating a picnic high up on the cliffs near St Michael’s Mount with the warm sun shining was an unforgettable experience. We had heavy rain on one walk and I did slip once on some rocks but circumstances meant anyone could have fallen there. We also enjoyed a trip to the Minack Theatre which is cut high into the cliffs, to see a Globe production of “The Taming of the Shrew”, a unique experience despite the numbing seating arrangement! 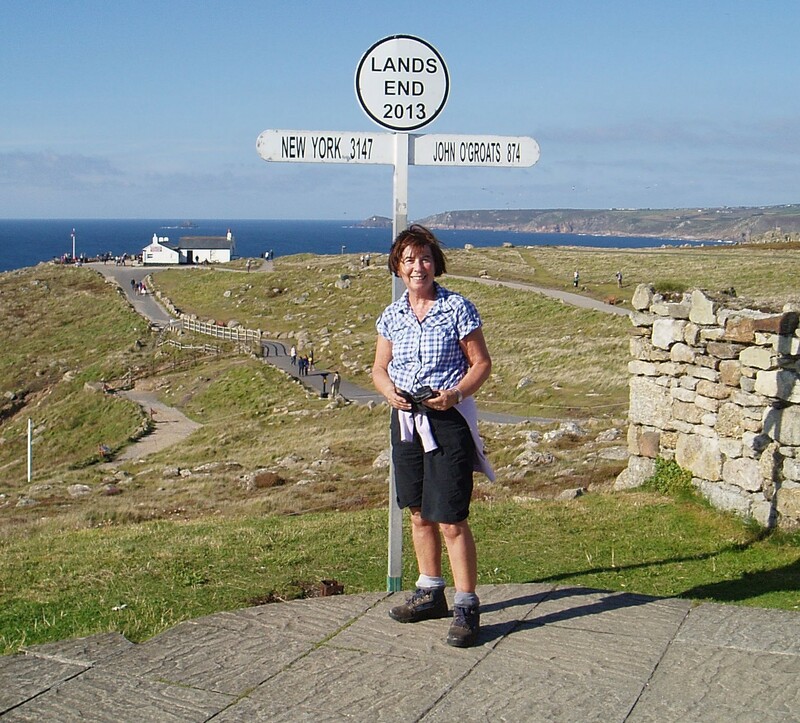 Many years ago my children had their photo taken by the signpost at Land’s End prior to cycling for a charity to John O’Groats in Scotland so I felt I should have mine taken there too even if I was merely walking in Cornwall. The Parkinson’s continues to have some impact on different parts of my life. This time it is the realisation that getting peas onto the back of a fork is becoming impossible and only by turning my fork over can I have a clean plate. Fine motor skills on my left side are definitely in decline! Also I have had to add some exercises to strengthen my rotator cuff, ie my left shoulder, as that area has become weaker. Billy Connolly’s diagnosis announced in the last few days has raised the profile of Parkinson’s and I was interested to note that there are 127,000 sufferers in the UK. Well done with the walking mum. Keep battling the veg!!! Glad you enjoyed Cornwall. Lucky you to get to the Minack Theatre. Jeff says he doesn’t waste his time getting them onto the back of his fork. So his advice is shovel them on ! Hi, We still have that photo of L and A on their bikes at Lands End. You don�t look any older than L. Stop complaining about the peas. No sympathy from me. I have never been able to keep peas on the back of my fork. We are at Coral Bay on the WA coast. It is only a small place but the water and beach are fantastic. Since we left home on 26 August we driven just short of 8000Kms with a 10 day break while we on the boat cruise. Today is a day of sitting by the beach [25*C] and resting. Head South to Perth etc tomorrow. Until you drive it you cannot appreciate the vastness of this Country. What is also staggering is the size and investment in the Mining industry in the Pilbara. Ugly but at the same time mind blowing in its size and complexity. Keep up the good work – I shall definitely not be serving peas in the future!!! You look great. exercises. Unfortunately we have today been given 7 October as our follow-up physiotherapy appointment at Stanmore so sadly won’t be able to hear all about everyone’s holidays. I’m afraid you will all have to repeat everything when we next meet. I am struggling with painful exercises but am sure it will all be worth while. Keep up with your hard work. You are looking good on it. PS runner beans are probably nicer anyway!!! Maybe you shouldn’t try it!